Since I first thought about cooking for charity or at least running a supper club, as it is more commonly known. I looked to a couple of sources for inspiration. The first inspiration was from a well established *supper club, run here in Norfolk, by a fantastically creative friend, Clarissa and her husband. I have eaten at a few of their supper club nights and what struck me was her unwavering ability to produce delicious food, stay calm and present her dishes beautifully on dainty vintage china to 30 diners. I knew to a certain degree, I couldn't ever replicate all this, but it did help me formulate the idea in to making it work in a fund raising capacity. 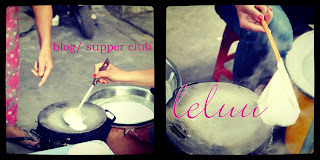 I was curious to know whether there was anyone doing a Vietnamese supper club and this is when I came across Leluu's Supper Club and her blog. Leluu is based in Hackney, London and from her home she runs a stylish supper club, serving Vietnamese food. Reading her blog, I viewed photos of her delicious food, tested out a couple of recipes and light heartedly envied her cool London lifestyle. However, after reading about Leluu the thing that stood out most, apart from her being of Vietnamese descent, was her mention of cooking along side her Mum. This struck a real chord with me and I wondered how I could meet them. I wanted to witness this relationship of Vietnamese Mother teaching daughter. The relationship, I imagine I am missing. Luckily, I did not have long to wait as Leluu and her mum hold Vietnamese cooking demonstrations. 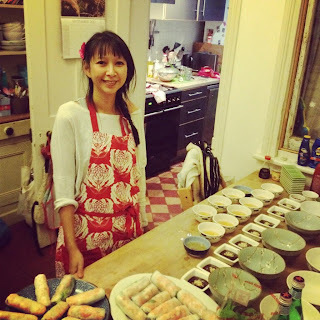 I took this chance to go along to one of these demonstrations, with my husband, and saw it as an opportunity to pick up a few cooking tips and stock up from the plentiful Vietnamese supermarkets in Hackney. A large proportion of the Vietnamese community reside in Hackney, so it has the most fantastic choices of Vietnamese cafes, restaurants and supermarkets. The cooking demonstration turned out to be just as I had hoped. 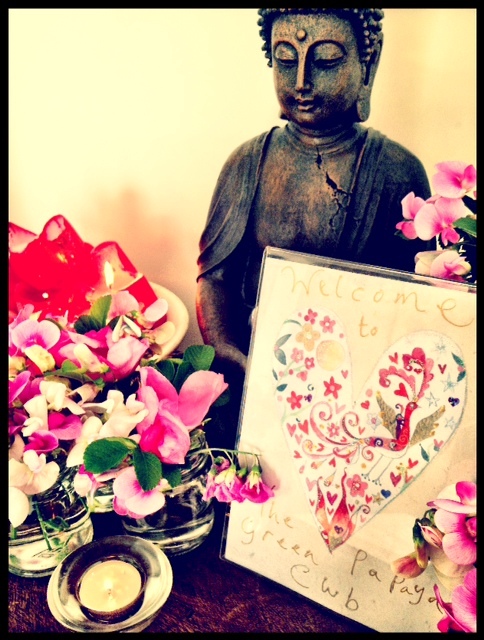 Leluu and her mum were warm and welcoming. Ten of us sat snugly around their breakfast table and rolled cold Summer rolls, watched sauces being thrown together by Leluu's mum, sampled their most delicious stock for Pho Bo (Beef Noodle soup), we had a chat and a smile with Mum over frying Banh Xeo (crispy savoury pancake) and finished up with Banana Fritters made simply with condensed milk and rice flour. Meeting Leluu and her mother gave me the final incentive to go ahead with my first charity supper, which was set five days after my visit with them. Up until meeting Leluu, I had self doubts about my ability and authenticity, without them realising they provided me with that extra bit of strength to 'go for it' and just through their kindness to me they gave me confidence. They were an inspiration to me just by allowing me a glimpse in to their very special relationship. 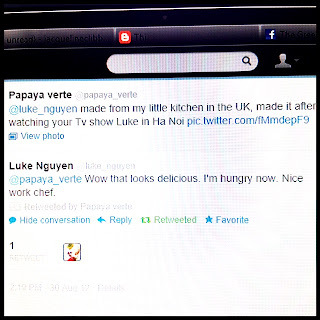 I also want to credit, the Australian chef Luke Nguyen. When I practised my dishes, before the supper club. I used to sit in to the night, watching back to back episodes of 'Luke Nguyen in Vietnam', with his books on my lap, 'Songs of Sapa' and 'Red Lantern' making lots of notes. I felt like he was my mentor. I loved the serene footage of Vietnam in the background, listening to Luke speaking Vietnamese with the locals and enjoyed the locals telling Luke how to season his Pho. The Vietnamese all seem to be expert cooks and critics! Anyway, very recently I made Bun Nem Ran, a dish of noodles and spring rolls, which appeared on Luke's Greater Hanoi episode. I took a photo of my dish, feeling quite proud of it and sent it off to Luke via Twitter. Being realistic I never expected a response, as I thought my tweet to have disappeared in to the cyber void, but just before midnight I had a reply! It was simple, but really made me so happy. Just imagine having a nod of approval from someone who inspires you and who seems so far out of reach, but really isn't. It's fair to say I was a little uncool about my reaction to his tweet reply and instantly re-tweeted it to my friends, plus posted it on Facebook, but hey these things happen only once in a life time. Saturday, 8th of September 2012 I held my first charity supper club. 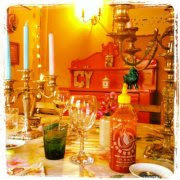 It confusingly has two names The Green Papaya Club and Papaya Verte Club. I may hold a vote. Preparation for the supper club was over two days. I chopped, stirred, poached, rolled and brushed away my darling children (for which I am still suffering guilt). My husband and his sister were 'employed' as hosts and waitress, to which they took their roles very earnestly. It should be noted they are both successful in their own right and it was very touching to see them so supportive. 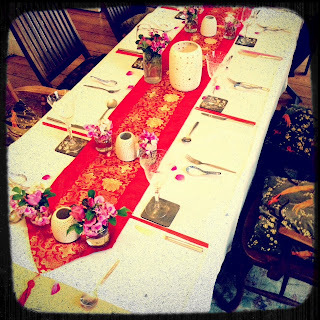 The supper was set for 8pm and I was to feed 10 diners plus one more, a last minute extra. I fully expected to be full of anxiety, panic and stress. In fact looking back at it, I did feel a twinge in the heart area, but didn't dwell on it for fear it would notice me noticing it! But I felt surprisingly calm. 8:15pm all the expectant diners were seated and my show was on. From that moment I felt like I had thrown myself out of an aeroplane, I felt like shouting as I was falling '....AND THIS IS A GOOD IDEA BECAUSEEEEEE?!!!'. Unbelievably, it went like clock work. The starters went, plates returned empty. The dipping sauces all looked too pretty in their dishes to be smeared about. Deep frying 40 Imperial Rolls was frightening, but I was temporarily distracted by the kitchen paper catching on fire. There is something rather fun about shouting 'Fire!' whilst the guests are laughing next door, oblivious. Cooking six rounds of Banh Xeo (the crispy pancake which has to be very quickly and lightly pan fried), was a challenge, but I pulled it off. 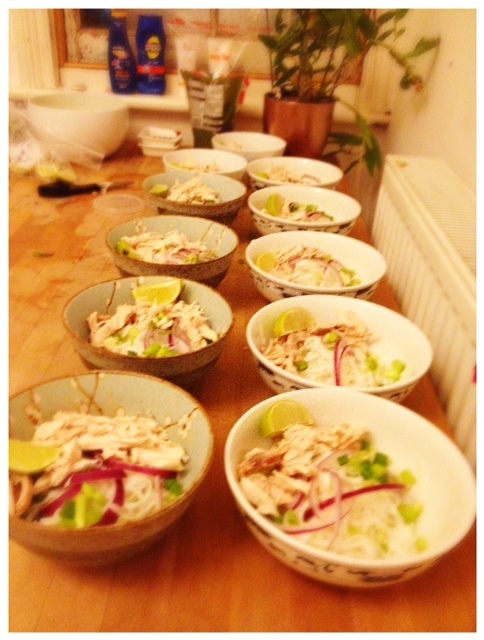 Pho Ga (chicken, vermicelli noodles in a clear broth which can take hours to make) was my main dish. The bowls looked amazing all lined up in a row, full of noodles, fresh herbs and chicken. Looking at them I suddenly felt proud of myself. I did this I thought, I really, really did...and even though my birth Mother is not here with me today, I knew she was there in spirit. She must have been otherwise all this could not have happened so well. I felt her gentle hand guiding and the spirits of my ancestors whispering, possibly the Grandmother tutting 'Not enough fish sauce! ', but they were all there in my tiny kitchen. Finally, in a nod to Leluu and her Mother, I served my guests Banana Fritters. I sat down to chop the bananas and dip them in the sugary silky condensed milk. My back had cried 'had enough' and my toes...well they actually hurt, I was fascinated by this, perhaps my imitation Ugg boots let me down. As I fried the banana fritters, I tuned in to the laughter omitting from the dining room, it made me feel warm. I loved their happiness, I know they were helped along by their wines, but their bellies were full and we were all feeling just little bit okay about life. The next day was an unexpectantly warm day and I suspect the last one before the cool Autumn days really kicked in, but it allowed me to sit in the garden, amongst my screaming children and reflect. I truly enjoyed the supper club experience. It was a lot of hard work, but I enjoyed the creativity and the challenge. I missed my children during the whole process and build up to the day, a renewed appreciation of working mothers was felt. I would love to do another, this time I would really have to work on making a bit more profit for the charity, as it has to be said this first one ran at a loss. Dragon's Den http://en.wikipedia.org/wiki/Dragons'_Den_(UK) would have made a meal of me, no pun intended! So, time to calm down a little, return to attending to my children and dream up the next supper club. Perhaps a pre Christmas one! Oh Darling Ms Papaya Verte. I've got tears running down my cheeks. Well done. It all looks so beautifully planned and followed through. I'm sure both your Mumma's were there right beside you. Me too x x you done good girl!